According to the statements made at the final press conference, the summit was rather constructive: there is progress in terms of its functionality and interaction within the Astana troika. The absolute need to respect the sovereignty of the Syrian Arab Republic was confirmed, regardless of any actions to combat terrorism, or remove threats to other countries and their own security. It is especially important that these statements included Turkey. 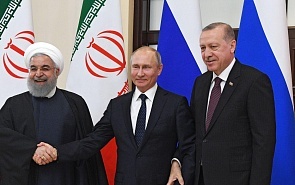 On February 14, 2019, another round of the Astana talks on the Syrian peace process between Russia, Iran and Turkey ended in Sochi. It was dedicated to bringing an end to the conflict in Syria. Now, when the terrorists are on the verge of a real defeat and control only a small piece of territory, the war is entering its final phase. In this regard, it is no longer possible to postpone a lot of the problems that have been accumulating during this time. Dmitry Egorchenkov, Director of the Institute for Strategic Studies and Forecasts at Russian Peoples’ Friendship University (PFUR), spoke in an interview to valdaiclub.com about what decisions were made at the trilateral summit. According to the statements made at the final press conference, the summit was rather constructive: there is progress in terms of its functionality and interaction within the Astana troika. First, once again, the absolute need to respect the sovereignty of the Syrian Arab Republic was confirmed, regardless of any actions to combat terrorism, or remove threats to other countries and their own security. It is especially important that these statements included Turkey. Regarding the Idlib problem, the parties all share a common understanding that the terrorists cannot remain there forever, that this issue still needs to be resolved. At the moment, the Idlib de-escalation zone, created in its current form following a separate request from Turkey, is not particularly effective. At the trilateral summit, this argument was sounded, and everyone agreed with it in one way or another. The only option here is the one that has proved itself in Syria in recent years: first the forceful destruction of terrorists, and later the restoration of control over the territory. However, this does not negate the collateral communication channels local elites use to coordinate political positions. On February 14, the leaders of Russia, Turkey and Iran will meet in Sochi to discuss Syria and hold separate bilateral meetings. Recently, new developments have emerged that could prove dangerous if each state pursues its own hidden agenda. The three states depend on the Astana format for settling the Syrian issue. The next question is connected with the Kurdish-controlled areas. All the negotiators have serious doubts that the US troops’ withdrawal will be fast. Everyone hopes that the Americans will fulfil their promises, but they also understand the associated difficulties, including American domestic political games. This picture has a second meaning: the withdrawal of Americans in one form or another should not lead to a power and security vacuum in these territories. During the final press conference, President Vladimir Putin said very firmly that these areas should be returned and placed under the control of the Syrian government. The security issues of third parties, including Turkey, should be resolved on the basis of this position. Turkey in fact has its own “red lines” and concerns about Kurdish extremists. However, it is doubtful that the future Manbij security zone will be under the control of Turkey alone. There are serious suspicions that this idea of Ankara’s was rejected by other negotiators, keeping in mind the Idlib experience. So far we do not see that Turkey has been able to solve such complex security issues. Against this background, the creation of a second de-escalation zone is also not yet visible. The last two questions concern the constitutional commission and the humanitarian situation. Regarding the first issue, a statement was made that the process had reached the final stage. Unfortunately, we did not hear from the leaders of the three countries whether the problem with the final stage of the commission’s formation and its sabotage by the Western states was resolved, as had been discussed recently during the meeting between Putin and Erdogan in Moscow. Putin rather evasively replied to a question from the press: he hopes that there won’t be any further obstructions, and everything will go as originally intended. Finally, the resolution of humanitarian problems should by no means be linked to any additional messages, such as the convening of a constitutional committee, or some external statements. Again, unfortunately, all three parties unanimously stated that they do not expect real help from players who claim to have a role in Syria but operate outside the Astana troika.